Despite its relative isolation, Kookynie is often in the vanguard of cultural (first Australian outback eruv) and artistic endeavours. In 2003 as part of the Perth Festival, British sculptor Antony Gormley was astute enough to select our front yard for an original sculptural installation of impressive dimensions. Actually it’s about 50 kms on a dirt road west of sister metropolis Menzies (pop. 120) at salty Lake Ballard, more or less just down the road from here. Gormley used locals as models for his quirky figurative sculptures, which involved naked auditions in a giant scanner to record body shapes. Reception was only lukewarm until $20 inducements were offered. 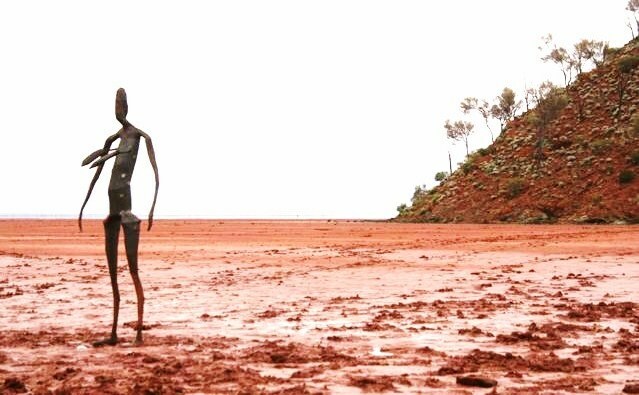 Planned for 3 months exhibition the fifty lanky steel sculptures still stand, and form the major tourist attraction 150 kms north of Kalgoorlie in our bit of outback. Not to be missed on your next trip out west, or east if you’re coming from Perth. Try to avoid the rainy season. 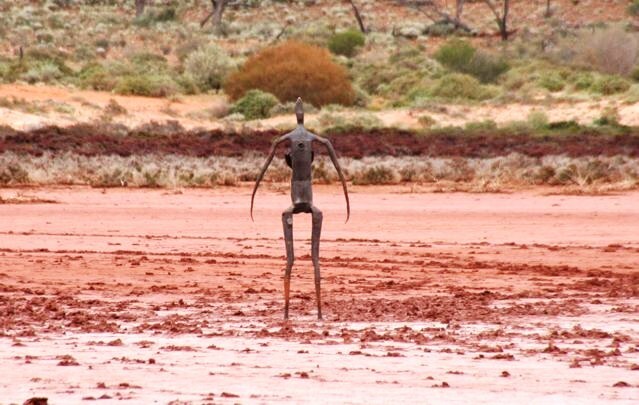 Now this bloke Gormley was obviously onto a good thing, and inspired by his near Kookynie experiences, decided to take his Lake Ballard ideas to the world. But he wanted large numbers of new sculpted figurines, and so the answer was simple: they had to be smaller, easy to mass produce and so made under license in China…..thousands of them, to reflect the rising tide of humanity or some such. Actually they previously had outings in a Walsh Bay warehouse in Sydney and elsewhere in the world. The clay figurines are not at all reminiscent of the famous terracotta warriors at Xian in China, but they sort of line up in a similar fashion. Dare I say, they do seem rather gormless, but that would be too cheap, which they probably are to make, using hands and clay only. Anyway, check it out, as the figures have proliferated like proverbial rabbits, numbering over 200,000, and certainly fill a space in England. No mention of Kookynie’s inspiration for the whole thing, but we’re just happy to share the Lake Ballard joy. Go forth global Gormley, with our blessing, and multiply! These little guys are keenly sought as souvenirs. There I was volunteering at the Biennale Walsh Bay event a few years back pouncing on sly fingers. There I was, numb from the cold winter winds seeping through the floorboards, watching the crowds become mesmorised by all the different faces of this mass of little clay guys. So what is art? That is indeed the question – I thought you would enlighten me? PS. Mesmerize or mesmerise – etymology from the 19C Viennese physician practising hypnosis: Franz Anton Mesmer.